My little one has been fascinated by moving toys since he was born, no matter what kind of toy he is playing, if it has movement included, he loves it! So, when at the Blogon UK, the famous brand Hexbug had some mysterious packages with their products inside, I couldn’t resist to pick up one to make a surprise to my little one! I was lucky to have a Robot War inside, it is not recommend for children less than 4 years, there are small parts and the pieces included which could be lost if not taken care. So, even if I have a little one, in this case I would wait till the baby it has at least 3 years to start playing with the Robot Wars. 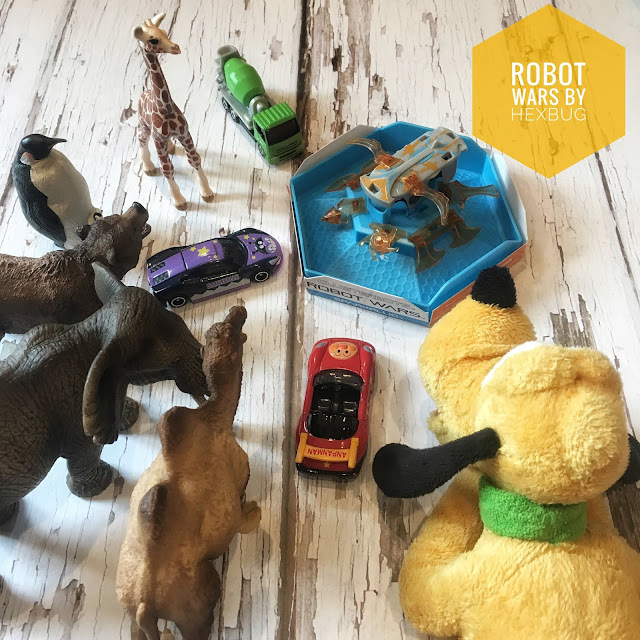 The Robot Wars by Hexbug are perfect to keep any little one entertained for a long time, they can run after them, dress their bugs with some “dangerous” armour or simply make a circuit for them. My little one loved to run after them, but I am sure that if I give him more time with it, he will make a little circuit for his loved bug. My little one loved the armour that was included (8 pieces to choose), trying to put and remove the pieces and looking how with simply the movement of the bug made the armour to move as well. I don’t know if you already know the Hexbug brand, they have a large variety of cute bugs with all kind of sizes, but my favourite ones are the Robot Wars and the Cuddlebots , the last ones are perfect for little ones, they move too and are soft to keep them safe. The Hexbug works with LR44 batteries, but you can find them at any store. Don’t worry, you will have toy for a long time! I would like to find pieces of armour sold separately, it would had been fun to mix colours! Or even a small circuit to help your little one watch their bug run in a more controlled way. Do you have any bug too?